Product prices and availability are accurate as of 2019-04-06 23:05:46 EDT and are subject to change. Any price and availability information displayed on http://www.amazon.com/ at the time of purchase will apply to the purchase of this product. 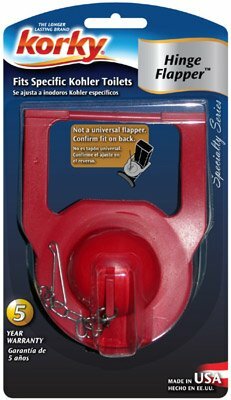 Kohler Hinge Flapper, Fits OEM #84995 & #1000490, Red Chlorazone Material, Shark Fin Design, Stainless Steel Chain, Fits Kohler 1 Piece Model Toilets: San Raphael, Rialto, & Rosario. Carded.